The version 1.3.0 of our WooCommerce Classifieds Extension was just released. If you have the extension installed then you should see an update notification in your wp-admin panel within 24 hours. This version includes the long-awaited Posting Packages. The posting package allows purchasing a single WooCommerce product (assuming the product type is Adverts Listing or Renew) and posting a couple of Ads. 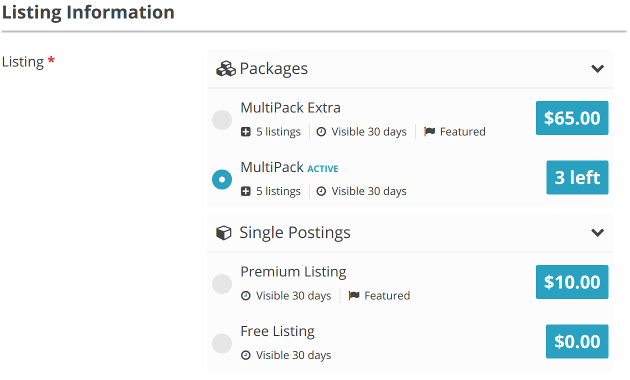 For example, in wp-admin / Products panel you can have a Multi-Pack product which includes 10 postings. When user will post an Ad on the page with [adverts_add] form he will be able to select a Multi-Pack in the Listing Type field. In the third step, the user will have to make payment. Once the payment is made a package will be assigned to the user account. Selecting Pricing or Package in [adverts_add] form. Next time a user will want to post an Ad he will be able to use the previously purchased package and post a new Ad without making a payment. The packages can be also purchased directly from your WooCommerce store, which will make it much easier to sell the Ads to users. For example, you can run a promotion for the Multi-Pack package. Users will be able to purchase it now even if they are not planning to post an Advert anytime soon. WooCommerce My Account / My Packages panel. How to setup all of this you can read in the updated WooCommerce Classifieds Integration docs. In the latest version, we also improved compatibility with latest WooCommerce, right now in order to use our WooCommerce integration you should install WooCommerce 3.0 or newer (ideally 3.3). In the wp-admin / Classifieds / Options / WooCommerce Payments panel we added a new options which allow selecting default pricing for new listings (in [adverts_add]) and renewals (in [adverts_manage]). This update is a 3rd out of 12 big updates we have planned for this year, soon we are planning two more updates. It looks like this is going to be a great year for WPAdverts :).